Firstly, I come from a family with a tendency to underactive thyroid. This is kept at bay by – yep you guessed it – seaweed! All of us (I’m one of five siblings) once we get into our forties, show the classic signs; plummeting energy levels, slow metabolism, weight gain, fatigue, dry skin, forgetfulness… but taking seaweed everyday sorts that out. I tend to go for a mix of seaweed I’ve collected for cooking and I use our Napiers Seagreens Organic Kelp Capsules when I run out. Obviously I’m biassed as I work at Napiers. However, the research that we did with the University of Glasgow was not biassed – it is clinically true that after 3 days just one capsule a day will correct iodine insufficiency and restore thyroid stimulating hormone (TSH) levels. It’s just a shame that the 60-70% of the British population who are iodine insufficient – basically suffering from malnutrition! – don’t know how easy it is to correct before its too late. Secondly, it’s all about taste, taste, taste. Seaweed is the umami of the vegetable world. 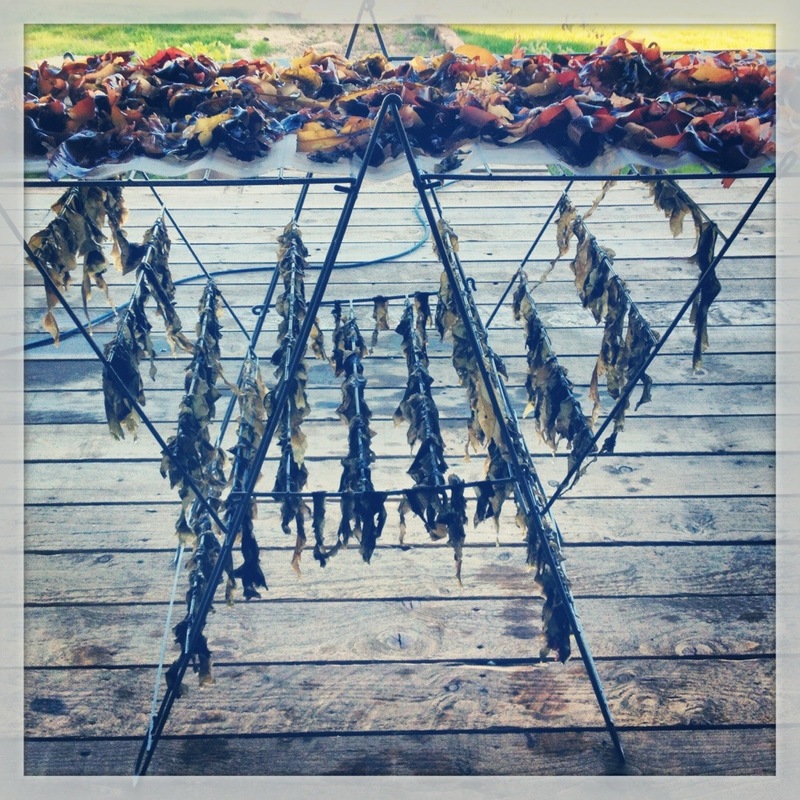 Harvest your seaweed where it is growing. Don’t just pick dead or dying seaweed off a beach. Collect it at low tide from the rocks where it grows. Cut it from the stipe (“root”) with a pair of scissors so that it can grow again. This way you’ll have the freshest seaweed possible. Ideally you should process it on the same day as harvesting, but certainly no later than the next day if you want decent quality. Rinse it. This is to remove any grit, snails, small crabs, etc. 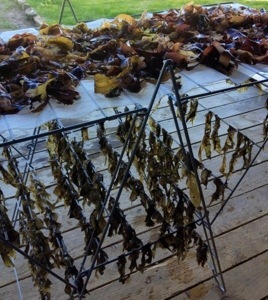 and for seaweeds used in savoury dishes can be done either in salt water or in fresh water. Don’t soak it overnight unless you want a slimy, gelatinous crop by morning! Also seaweeds like dulse will give up their colour and you’ll be left with a pail of purple water. The best way is to plunge handfuls of seaweed into big pail of water, give them a good swirl around and take then straight out into a colander while you get on with the next batch. For seaweeds that you’re planning to use in desserts, like carrageen, wash then thoroughly in fresh water. Then hang up on a line or use a laundry dryer if it’s a sunny day. If it’s raining use a dehydrator on a low setting so that you don’t scorch all the nutrients out of it. Once thoroughly dry you can store in sealed containers (any contact with the air will make it prone to absorbing moisture and shorten its shelf life) – either whole, or ground in a coffee grinder as a seasoning.